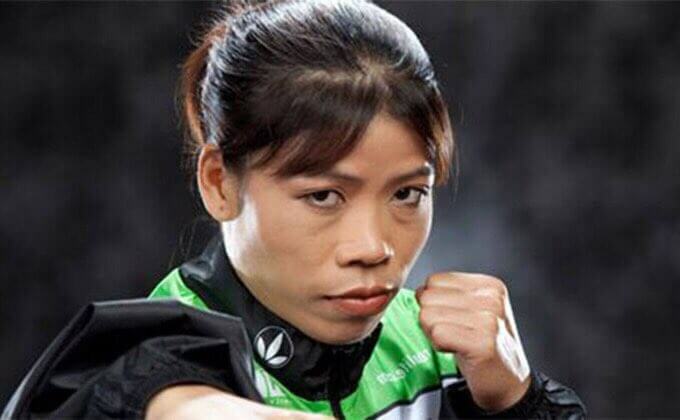 Chungneijang Mary Kom Hmangte was born in a poor family in Churachandpur district of Manipur, India. Her Parents were tenant farmers & Mary Kom used to help her parents by working in the fields. While in school, she used to play many sports like hockey, athletics & football. She got interest for boxing when she got inspired from a local boxer Dingko Singh, who won Gold Medal at the Asian Games, 1998. Mary Kom made her way to boxing, but the way wasn’t that easy. Her father wasn’t in favor of boxing. He used to worry that who will marry her daughter when her face would injure in boxing. Financial arrangement was also a challenge. Despite all challenges, Mary Kom started her boxing training under her first coach K. Kosana in Imphal. In earlier days, she had to spend many hours in traveling everyday to manage her training. It all started in very young age for Mary Kom. When she was just 15 of age, she decided to leave her hometown and study at the sports academy in Imphal. After that, she trained under the Manipur State Boxing Coach M. Narjit Singh. Mary Kom first career win came in 2000, when she won the ‘Best Boxer Award’ at the women’s boxing championship in Manipur. She proceeded to win the Gold in the East India Women’s Boxing Championship held in West Bengal. After Marriage in 2015, She took a break from boxing. But, this isn’t the end of her career, Kom again started training after their first two children. After that, she won a silver medal in 2008 Asian Women’s Boxing Championship And a fourth successive gold medal at the AIBA Women’s World Boxing Championship in China. Mary Kom is the only Indian woman boxer to have qualified for the 2012 London Olympics. She was competing in the 51 kg category & won Bronze Medal. She became the first Indian woman boxer to win a Gold Medal in the Asian Games in 2014 in South Korea. She was also the first woman boxer to win Gold Medal at the Commonwealth Games 2018. She has won many medals in many International & National Boxing championships like Summer Olympics, Asian Games, Asian Women’s Championships, Commonwealth Games & so on. She got many awards & recognitions for her dedication for the sport even in diversities. She got Indian Govt. prestigious awards Padma Bhushan, Arjuna Award & Padma Shri in 2013, 2003 & 2006 respectively. The International Boxing Association (AIBA) awarded Mary Kom with the first AIBA Legends awards for “Promising Boxing Career”. AIBA announced her as the Brand Ambassador for 2016 AIBA Women’s World Boxing Championships. On 26 April 2016, Kom was nominated by the President of India as a member of the Rajya Sabha, the upper house of the Indian Parliament. In March 2017, The Ministry of Youth Affairs and Sports, Government of India, appointed Mary Kom along with Akhil Kumar as national observers for boxing. She became people of the year in Limca Book of Records, 2007 apart from many other awards. ⟵Do We Really Need to Ask Salary to Judge Someone ! !